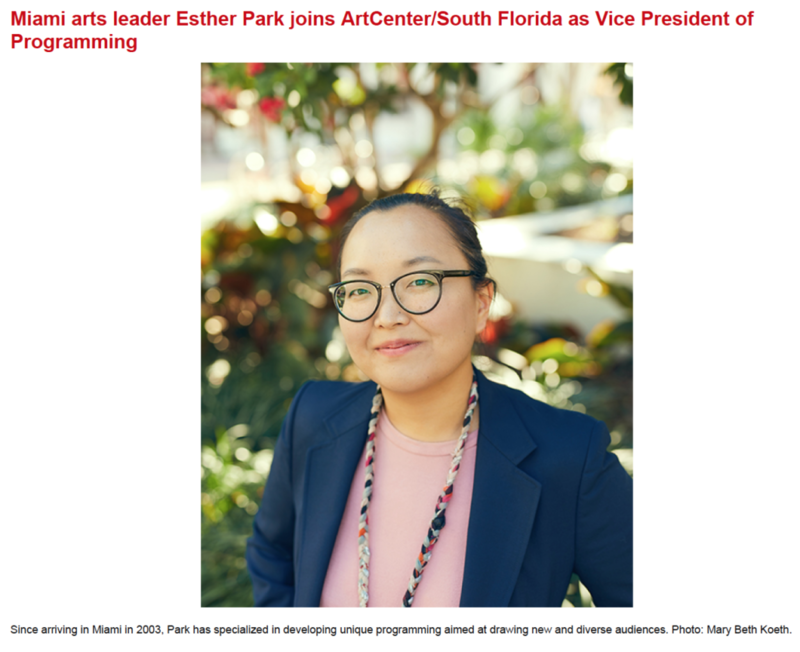 Esther Park, a South Florida arts leader known for her risk-taking cultural programming, will join Oolite Arts as the organization’s new vice president for programming. At ArtCenter, Park will lead the visual arts organization’s initiatives, including its new conversation series Talks, which is in partnership with Locust Projects, ArtFilms, which features movies by and about artists, as well as ArtCenter’s signature artist residency program and other efforts to be announced in the coming year. Since arriving in Miami in 2003, Park has specialized in developing unique programming aimed at drawing new and diverse audiences. A long-time music journalist, she has also served as director of programming for the Adrienne Arsht Center for the Performing Arts and for MOCA, where, for example, she brought in hip hop legends De La Soul for a b-boy competition in honor of legendary contemporary choreographer Merce Cunningham.